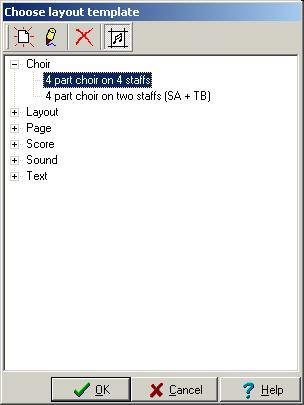 By selecting a template from the layout templates dialog you can modify current melody in well defined way without the need to alter numerous individual settings. Layout templates are plain (MusiCAD) files that are read from the template directory as specified in the places dialog under preferences. will create a new template based on the current melody. You will have to edit the template most of the time to let it be most useful.